335 in stock Need More ? (18) Suitable for 18 years and over. Former Army Ranger Cameron Poe (Nicolas Cage) is returning home on parole to his wife and child after serving eight years for manslaughter. The plane he is flying on is a special convict-only transport plane filled with some of the meanest and deadliest villains of them all. 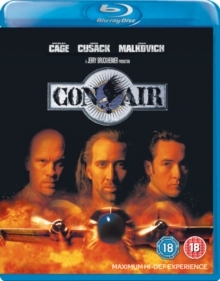 Once in the air, however, the plane is hijacked by convict Cyrus 'The Virus' Grissom (John Malkovich), who gets rid of the plane's crew (prison guards) at the first scheduled stop, picking up more convicts as he does so. But US Marshal Vince Larkin (John Cusack) is already on his trail. Poe does his best to stop Grissom from escaping with the group of convicts, and just to complicate matters further his diabetic cellmate Baby-O reveals that he will die if he does not receive his next insulin injection within two hours.